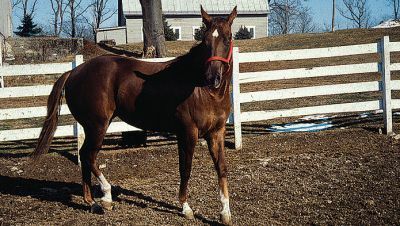 Wooden fences are popular with horses for chewing, cribbing, wind sucking, and other vices. If a rail comes loose, a nail may stick out and cut the horse. If a rail breaks, it can be lethal to horses. Some have been killed by spearing themselves through their chests with a piece of wood rail. It's possible to protect such fences by running a strand of tape along the top rail. Electric String: Electric string offers limited physical protection as it is easily breakable, limiting its effectiveness. Electric string can easily short-circuit, because with only three threads of wires the charge is distributed unevenly over its length. The string is too small for a horse to see. The string does not give a sufficient shock to warn the horse. Electric Cord: Electric cord is significantly stronger than electric string (resistant to two tons of pressure). However, frightened animals pushing against it can damage themselves (particularly where visibility remains an issue). In Sweden we know of more than six cases where horses have been permanently injured. The Dutch National Stud Farm installed it to enclose her stallions. The result is in the picture. Pig Netting or Electric Netting: This form of mesh is commonly used with smaller animals. However, there is a strong risk that horses will get a limb tangled in the mesh, and be unable to withdraw it while in a frightened state. Vinyl fences look nice when new and are safe. However, horses do use it to rub against them. An adult horse can exert about 500 pounds of lateral pressure and this quickly plays havoc with plastic fencing. Ideally vinyl should be protected with one or two strands of electric tape.